You might decide to make these bars as a surprise for your kids in their school lunch. Maybe you’ll make them for a fun afternoon snack. 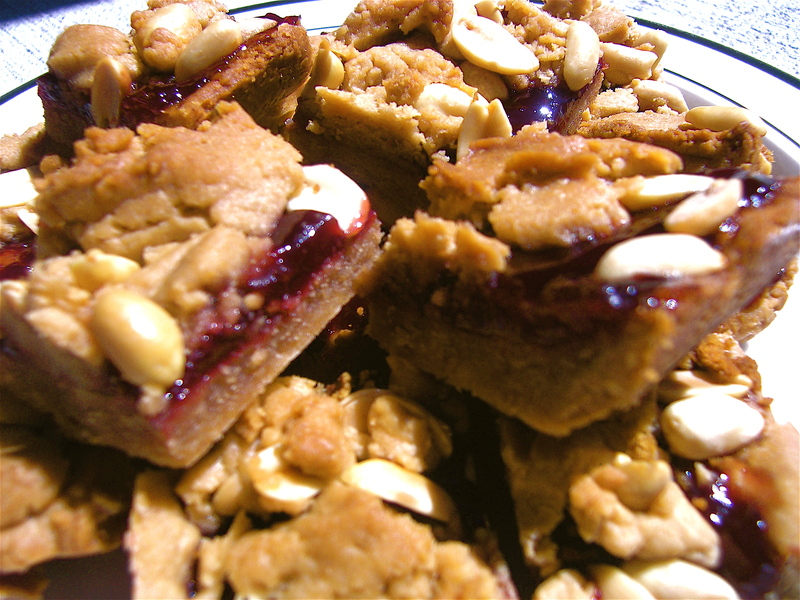 And if you don’t have kids, you should make Peanut Butter and Jelly Bars as a great treat that brings back all the memories of childhood. This bar recipe is originally from Ina Garten; I’ve modified it to make it just a bit healthier and added some adult spices. 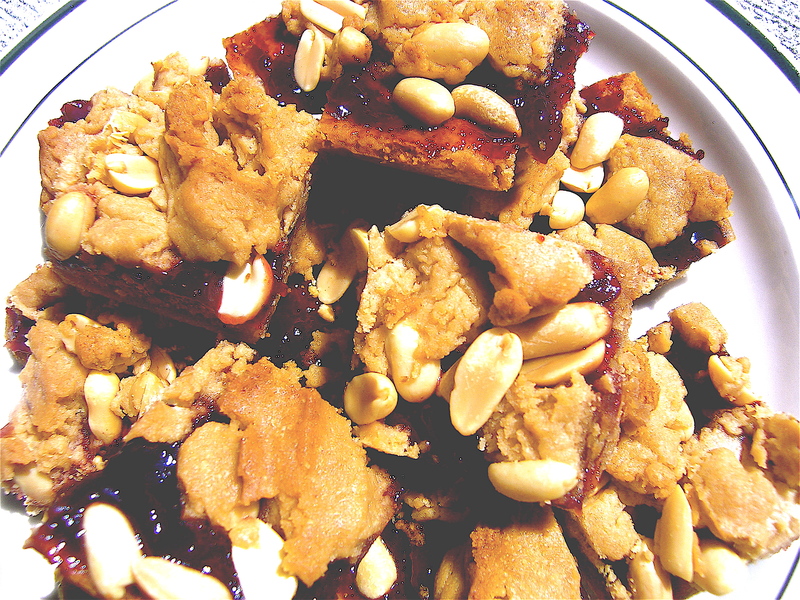 But the philosophy is simple and perfect: peanut butter cookie dough as a crust, a healthy layer of raspberry jam, and a final layer of cookie dough crumbles on top with lots of crunchy peanuts. A little bit of heaven, no matter how old you are. Whip the butter and sugar in a mixing bowl. Beat with a mixer for about 3 minutes, or until the butter is light and fluffy. Add the Greek yogurt and combine. Add the eggs one at a time, adding the vanilla with the second. Add the peanut butter and mix until combined. Add the baking powder, salt, nutmeg, and cardamom to the butter mixture with 1 cup of the flour. Mix on low speed until just blended, add another cup of flour, and repeat until all of the flour is combined. Spray a 9 x 13 inch baking dish with cooking spray. Place a piece of parchment paper across the baking dish so that it sticks out the sides. Coat the paper with cooking spray and a thin layer of flour. Spread 2/3 of the peanut butter cookie dough into the bottom of the pan and use your hands to press it flat to the bottom.. Use a spatula to spread the jam across the entire cookie dough layer. Loosely combine the peanuts with the peanut butter dough and crumble across the jam layer. Leave part of the jam showing so that both elements show after baking. Bake in the oven for 45 minutes, or until brown. Let cool completely before lifting the bar out of the baking dish. Cut into 32 bars (8 across the long side, 4 across the short side). Had to make these! Delicious!!!! !